This is something I’ve wanted to try for a while now, but popping open a jar of sauce has just always seemed so much simpler so I never even bothered. But now I know. 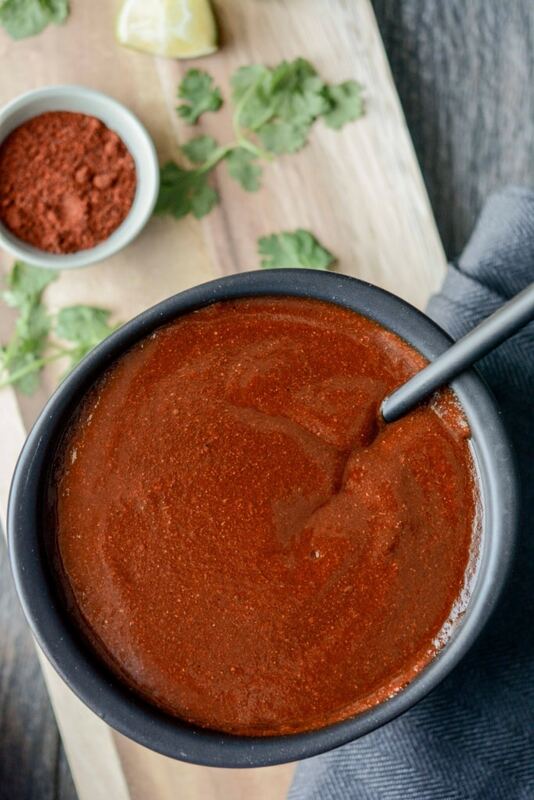 Making your own enchilada sauce is insanely easy. It can totally be make in a sauce pan on the stove, but just for fun I made it in the slow cooker instead and it was just that much easier (read: lazy girl who doesn’t want to stir)! Just add the ingredients and walk away! My world has just changed a little and will now include a whole lot more homemade sauce. Make a single, double or even a quadruple batch and freeze! Then you will have all sorts of sauce ready to go for all sorts of easy meals. 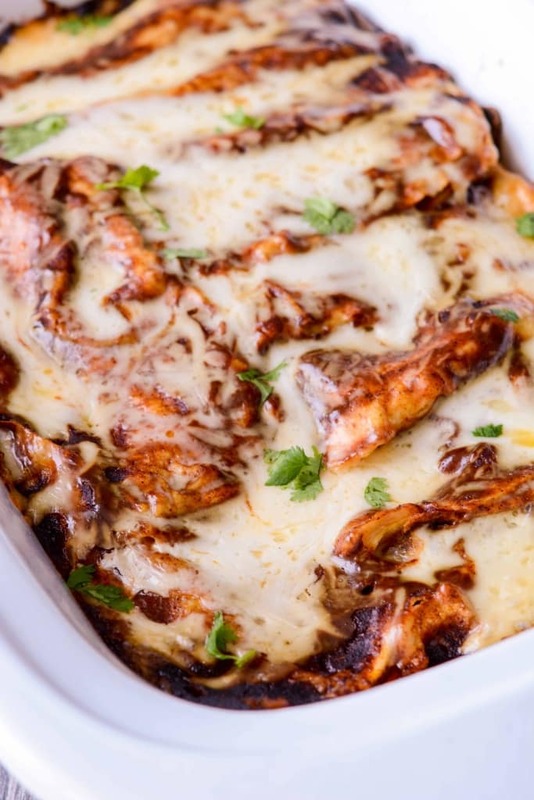 Like these Slow Cooker Mushroom and Spinach Enchiladas (sneak peek!) that I will share with you tomorrow! Don’t get me wrong, I still have my favorite go-to store bought sauces that will be staying the line-up (Hello, Trader Joe’s!!) but now I have yet another way to make a simple and totally customizable sauce for so many more recipes! So what do you think? Easier to stick with popping open a can, or worth the effort to make homemade? I hope you will give it a try! Recipe makes about three cups of sauce. I think you can up the flavor profile as well by using whole chilies and a variety – ancho, guajillo, pasia, chipotle, New Mexico dried, etc. I haven’t seen the others, except NM, in dried form very often tho. If you used whole (and maybe whole cloves of garlic, roasted and not) you’d want to blend it at the end. 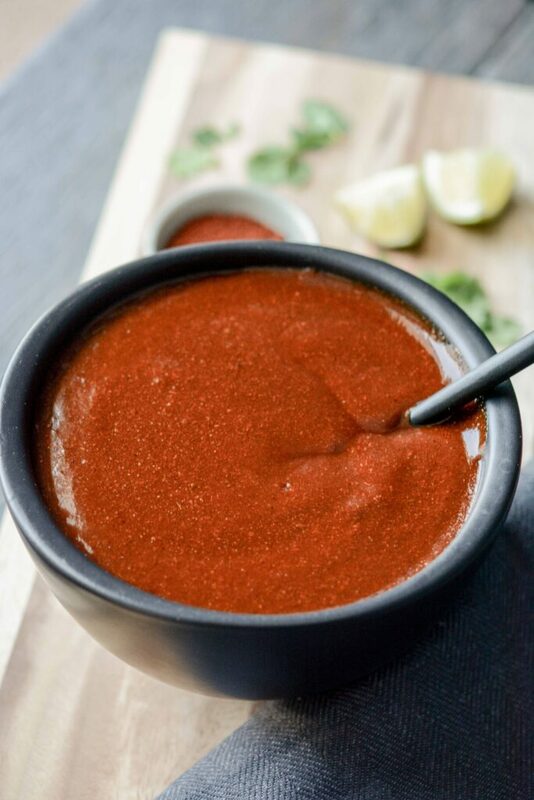 Nit picky perhaps but I distinguish ‘chili’ powder which is a blend of spices, from ground ‘chile’ powder, e.g., ‘ancho chile powder’ which are pure chile powders, no cumin, garlic, onion, etc. I like this idea tho. Especially being able to freeze it. Thanks! I am a native New Mexican. I have made and cooked red chilie sauce for seventy years, from community and family recipes. And NEVER used tomato anything in the fix’ns. Please check your sources. Hi Linda! Thanks so much for the note. Yes, I don’t claim to make recipes authentic to every style of cooking (although I’d love to have access to all those family secrets!!). 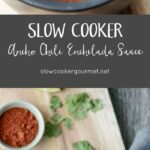 My goal is to create delicious, simple and approachable recipes for home cooks who love to use their slow cookers. Any recipes that have been passed down to me for enchilada sauce have always included some form of tomatoes, so I guess this is just what I’ve been used to 🙂 If you have a recipe or tips you’d be willing to share, I’m sure everyone would love it even more! Hi. 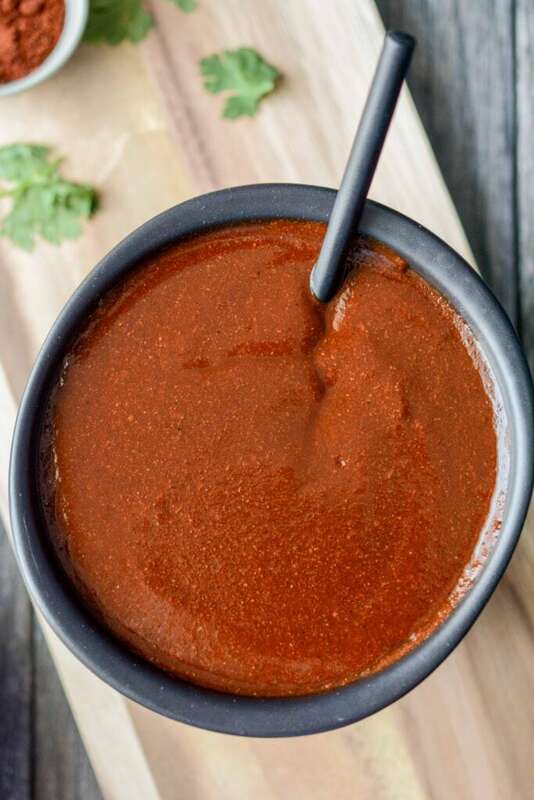 Just found this via a search for an enchilada sauce recipe. It was pretty darned easy, and tasted great. I’ve only cooked with enchilada sauce a few times, and always used a canned sauce. I guess I always assumed enchilada sauce had some trickery to it, or something. I made this twice, exactly as written. Once I used chicken broth, and once vegetable broth, but my palate really couldn’t tell the difference. The first time I had enough anchi chile powder, but the second time not enough, so I made it up with regular chili powder. Also, I only have a large crockpot (5 quarts, I think) so that was overkill, but it still cooked up nicely; once I used the “low” timing, and once the “high”. 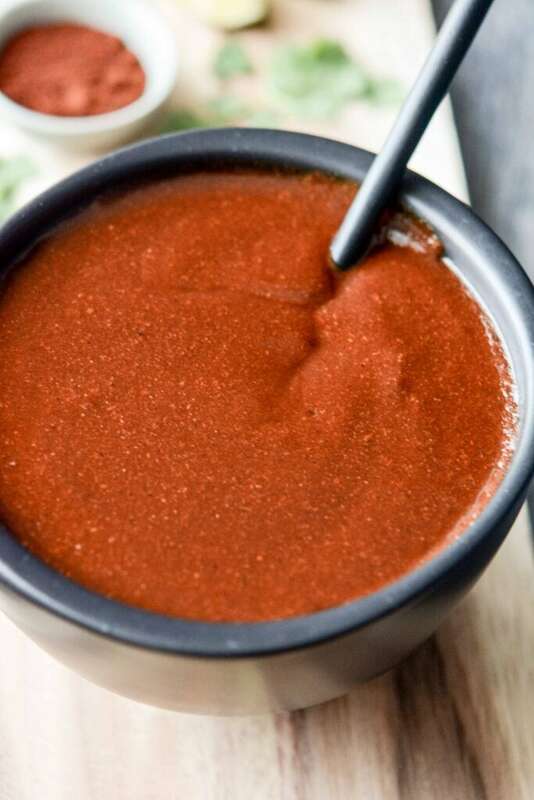 It all made a smooth, tasty sauce that I used in a chicken enchilada casserole. I try to cook a lot, and now I guess there’s no reason, other than sheer laziness, to make my own enchilada sauce. Hi Kevin!! Thanks so much for letting me know! I’m glad it worked out for you! I actually just bought the ingredients to make this again myself since we are having company during Thanksgiving week and I’d like to make a meal that’s a little different one night. You could double up the recipe since you have a larger slow cooker and keep the extra in the freezer! It freezes nicely then you always have some on hand.